We call this our "Mini" unit but there's nothing mini about the mighty way it picks up nuts! 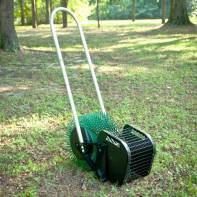 Designed especially for 1-2 trees, this easy-to-use nut harvester is as simple as pushing the lightweight unit over the nut harvest and watching as the nuts are grabbed by the patented magic finger design and ejected into the collection basket. Once ready, the basket is easily lifted for emptying. Easy-to-push handle, thorough magic finger-grabbing action, sturdy yet lightweight construction. No more bending down to pick up nuts; no small roller that has to be passed over the same area over and over. Push, collection and empty! That's it!